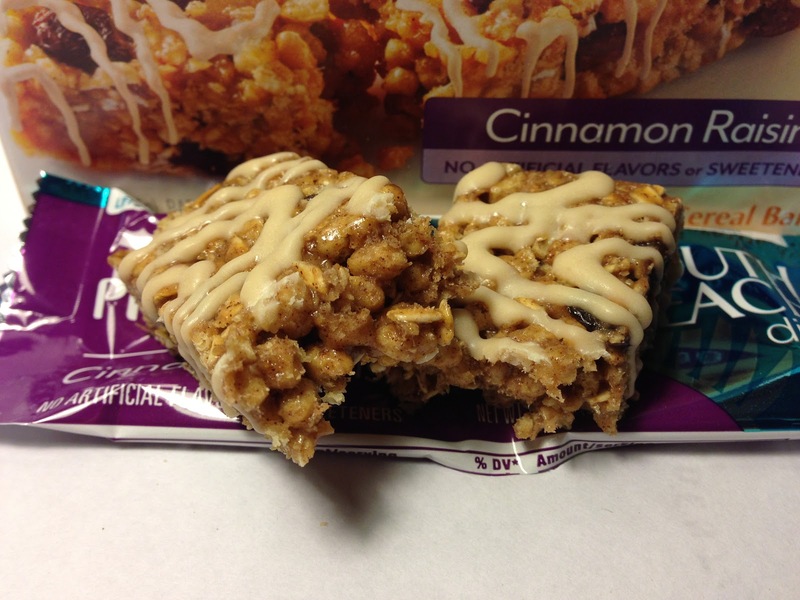 As you can see, this looks a lot like your standard oat based nutrition bar. The bulk of the bar is made up of oats and soy crisps that are then mixed with the add-ins of the bar. Since this flavor is based on raisins, there were a bunch of raisins included in the mix. The bar was topped with a yogurt icing that was mixed with cinnamon that gave it a somewhat brownish hue. It was that cinnamon in the yogurt icing along with the cinnamon in the general mix of the bar that gave this bar a strong cinnamon smell that worked well with a strong raisin smell. Based on looks and smell alone, I was beginning to think this was delicious because those two characteristics made my stomach growl (it's growling again as I type this review after the fact and am thinking about it again). As I bit into the bar, I learned that the looks and smell were not deceiving as this was downright delicious. The raisin taste was strong and sweet and the cinnamon "spice" was a bit more than I expected, but it was not something that overpowered the raisins in anyway. Somehow, the two ingredients found a way to both have strong flavors but not have on dominate the other in any way. They actually worked in perfect harmony. The yogurt icing wasn't really noticeable in flavor other than the fact that it brought additional cinnamon to the table, but it did provide a somewhat gooey mouthfeel to the dry-ish chewy oat and soy mix. All in all, this was the perfect mix of cinnamon and raisins. Buy It or Fly By It? My last sentence just called this a perfect mix, so this bar obviously gets a BUY IT rating. 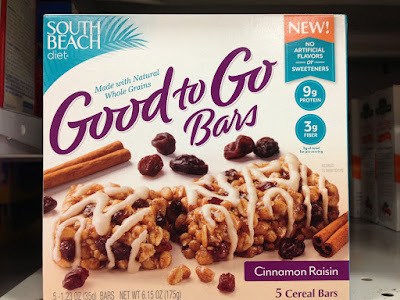 It's an excellent introduction to the blog for South Beach Diet bars because this bar was so incredibly delicious that I'm craving one right now. It's probably a good thing the rest of the bars are at home or else I'd probably finish the remaining four in about two minutes because I'm craving one so bad now. If the real South Beach has flavors like this, I might actually want to go now. I might even unbutton my shirt half way down in the process and show off my chest hair. Okay, maybe not.